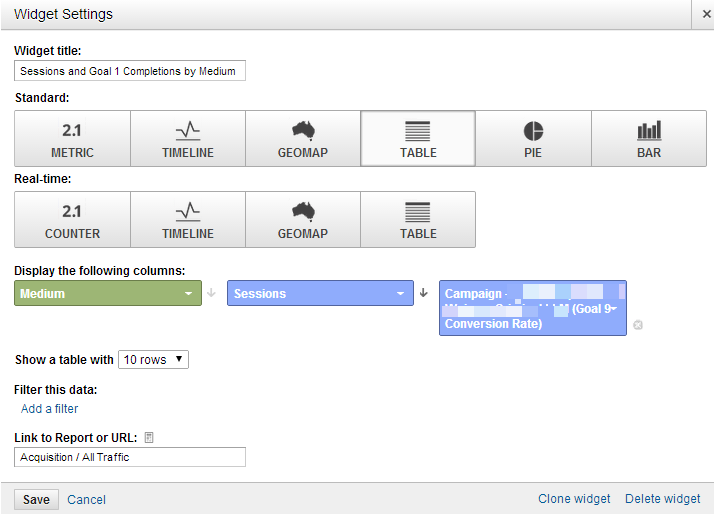 Google Analytics is great...we've covered this topic before. Not only does it give you great insights into what's happening on your website, but it's FREE. What small business doesn't love a great product that is free? However, we also understand that not everything that is in Google Analytics is important to everyone, but there is definitely some high level stuff that the "higher ups" in your business should be able to see at a moments notice. That's why the Dashboards are great. They allow you to see what's important to you, quickly. If they don't want to see how they are performing online, shame on them...but you may be able to convince them to take more notice if they knew they could quickly see their most important KPIs (key performance indicators). 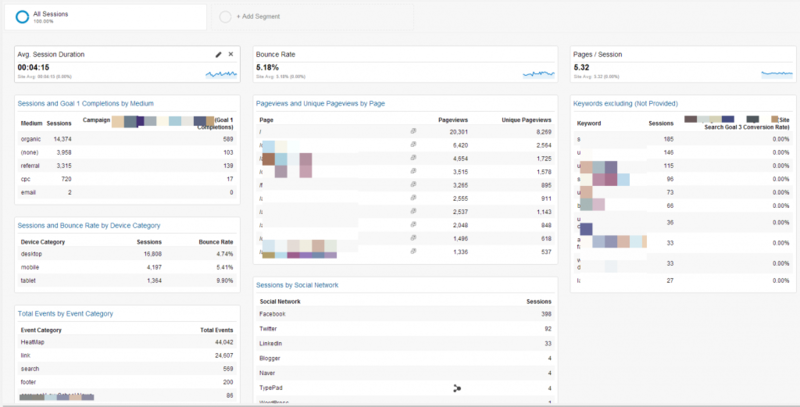 So, to help you out we've created a Google Analytics Dashboard for anyone to use. This dashboard is geared to that person that wants to see high level stuff, but still looking at whats important. We want to get past only looking at traffic as a metric. Sure, we want traffic...but as we've said before, traffic alone doesn't mean anything. Instead of looking at just traffic, you should be looking at where your traffic comes from and how that correlates with conversions, performance on various devices, top content, events, etc. But at the same time if you have to dig for this information, you'll avoid monitoring the performance. That's exactly why we've set up this dashboard that you can import to your Google Analytics account for you or others at your business. 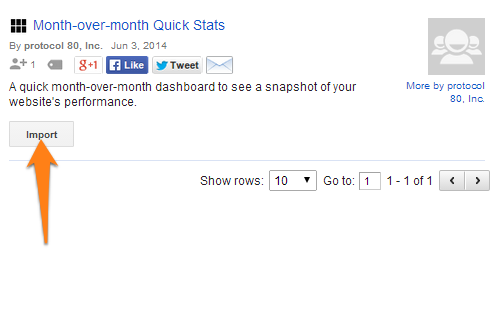 Here's how you add our dashboard that we use for high level month over month comparisons. 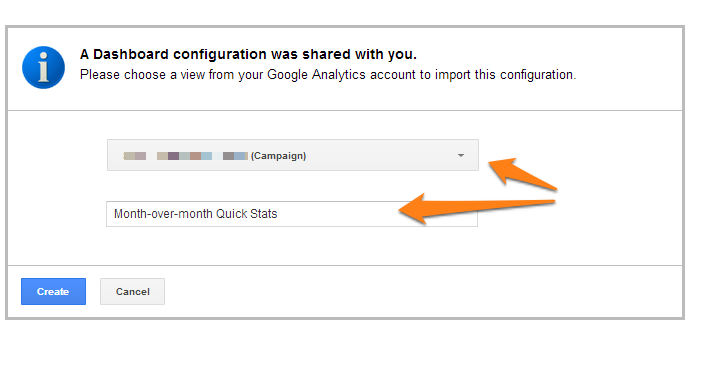 First, log in to your Google Analytics account by going to Google.com/Analytics and choose the website you'd like to add the dashboard for. After you are logged in, click +New Dashboard on the top left. 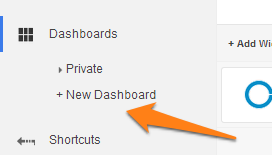 From here you'll have an option to create a new dashboard or import one. Choose import. When you click import you can browse a list of available reports, dashboards, segments, etc. 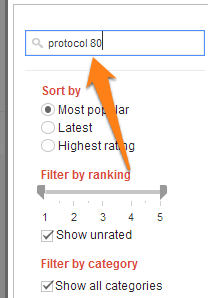 (there are some great ones), but if you are looking for ours start by searching protocol 80. From here, you'll probably only see one called Month-over-Month Comparison. That's because we use it primarily for that, but it doesn't mean that you can't look at a year, 2 years, or even a week. When you find it, click import. Now you'll be able to give it a name that makes most sense to you and if you have multiple websites or profiles, choose the one you'd like to add it to from the dropdown list. Now you'll be able to use the dashboard. You might want to compare month-over-month, year-over-year, etc. The dates are flexible, so choose what's most relevant to you. We compare traffic along with conversions. As I mentioned, just looking at traffic alone isn't a good practice. You can adjust these widgets to show what is most important to you by clicking the pencil. You might want to look at conversions, events, bounces, etc. You can also see that you can easily adjust how you view the data so if you'd rather see a pie chart, that works too. Make it your own! When you are done, you should see something like this. For the sake of the length of the screenshot, I've taken of the date comparison. This is just a starting point. Continue to customize this dashboard so that it's perfect for you and your business goals. Google Analytics can be one of the best assets that your company has if used appropriately. Need some assistance with that? You should contact us today!